When The Justice Tarot Card appears in a reading it can often represent fairness, justice and an equilibrium in all dealings with people. It is a great omen concerning your business deals, partnerships and any legal issues you may have. This card also signifies the righting of a wrong that has been done to you in the past. Also, quite possibly the justice your were seeking for another has been served. The Justice Tarot Card is a karmic card. This means that it delivers good fortune and rewards for past efforts, even if you are unsure why you are being favored. 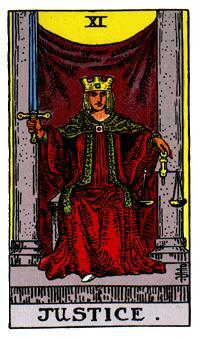 Keep in mind that negatively The Justice Tarot Card represents injustice. This can mean business deals that fail and legal decisions that won’t go your way, even if you are morally right. Another negative aspect of this card is that it can symbolize you receiving bad advice and using bad judgement be be careful and discuss this at greater length with your reader.